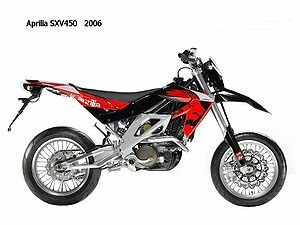 The Aprilia SXV 4.5 is a motorcycle produced by Aprilia in 2008. 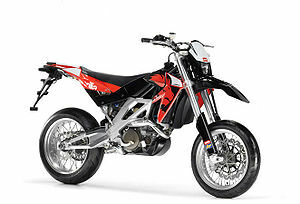 Aprilia is re-inventing itself. Renowned at the end of last century as a purveyor of championship-winning sportbikes (some kid named Valentino Rossi won 125cc and 250cc world titles on them), the Italian company is, in the wake of its recent purchase by Piaggio, returning to its off-road roots. 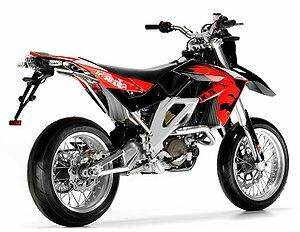 The 2007 model line will include no fewer than four off-road models featuring 450cc and 550cc engines in RXV enduro and SXV supermoto versions. Dirtbikes or not, these latest Aprilias glisten with Italian style. The achingly gorgeous frame consists of a tubular-steel trellis interference-fitted to pressed aluminum side plates that wrap down to support the braced, box-section aluminum swingarm. Even the exhaust is stylized, the muffler pulling double duty as the rear subfender before terminating in dual outlets under the seat. The most unusual facet of the design, however, is the engine--it's not the typical carbureted single, but a fuel-injected, 77-degree V-twin. I had a chance to ride an SXV 450 in conjunction with a West Coast Supermoto School at Northern California's Stockton Motorplex. While both the RXV and SXV are street-legal overseas, they have yet to be homologated for the U.S. market so will initially be labeled For Competition Use Only. Furthering that intent, the bike I sampled had been race-prepped by WCSS principal Darrick Lucchesi, stripped of its lights and fitted with 16.5-inch rims shod with Dunlop slicks in lieu of the stock 17-inch street tires. Everything else, however, remained stock. Plop down in the narrow saddle and the SXV feels tiny, and it doesn't get any bigger after you push the starter button. It's so quiet you almost can't tell it's running. Even at speed, students said all they could hear was the Aprilia's footpegs tinkling on the pavement behind them. That quietness is deceptive because the SXV 450 is surprisingly powerful. 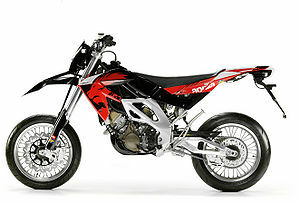 Aprilia claims 60 bhp (70 for the 550), which is 10 or so more than a comparably sized single. The thing is, it doesn't feel that strong. Roll on the throttle at a corner exit and the power comes in small traction-producing pulses, as opposed to the big traction-disrupting bangs of a single. It doesn't tend to wheelie like a single, either, it just drives, drives, drives. Hold the throttle to the stop, let the revs rise to the 13,000-rpm redline (titanium valves, dontcha know) and there's very little vibration despite the lack of a counterbalancer. Statements about speed are largely irrelevant at a go-kart track, but the SXV was able to reel in all but the fastest 450s and 525s on the straights. That said, the V-twin's real advantage lies not in power, but in handling. With its small crankshaft located close to the front wheel it has mega front-end grip, which, combined with its stout 48mm inverted fork, means zero chatter. Further, the reduced inertia of that lightweight crank makes it easy to flop the bike from side to side, which is what you spend most of your time doing on a supermoto track. It should be a lot of fun on the street, too. 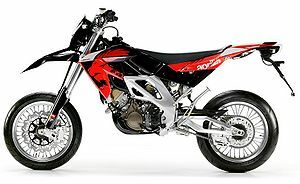 Traditional supermoto singles are fun but slow, while the new generation of twins such as the KTM 950 SM and forthcoming Ducati Hypermotard are fast but heavy. The SXV--particularly in 550cc guise--may just strike that perfect balance. The competition won't even hear it coming. Front Suspension 48 mm upside down fork, double adjustment. This page was last edited on 1 February 2011, at 22:36.